What’s even better than an inspiring, innovative, and useful book that helps us thrive? One that also supports a good cause. 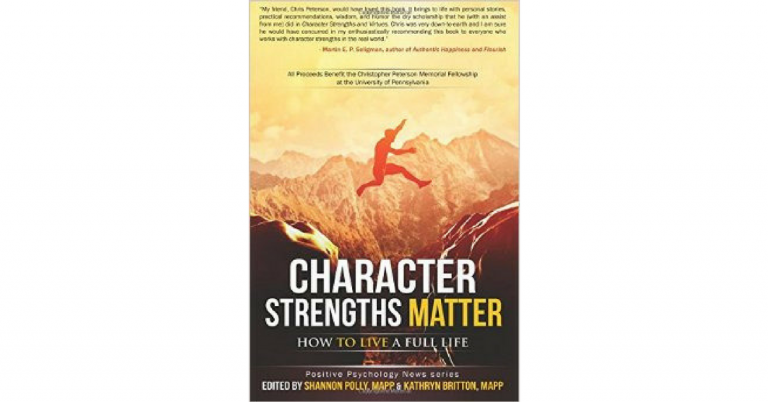 Character Strengths Matter: How to Live a Full Life, edited by Kathryn Britton and Shannon Polly, is just such a book. Despite devoting extensive time to learning how to discover, develop, and apply strengths, and teaching the same to numerous organizations, I learned a lot reading this book. I also developed my own strengths further. Section Two explores cultivating strengths in business, taking strengths on vacations, and other interesting approaches to discovering and developing strengths for certain populations such as young children. 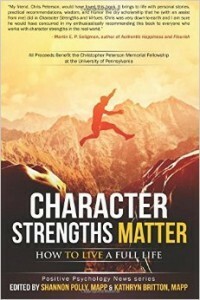 Proceeds from the book benefit the Christopher Peterson Memorial Fellowship at the University of Pennsylvania; Chris Peterson helped develop strengths scholarship and the VIA assessment. Is this book perfect? No. Like any collection of writing by various contributors, the style and focus of each entry vary, sometimes in a way that can be a bit disorienting. I also would have found it useful to have more information about each author, and links to learn more about them. But this book doesn’t have to be perfect in order to be useful. It just has to be strong. And it is very, very strong. I recommend it highly for anyone wanting to develop a full life and thrive. ← Truly Tap Your Strengths To Do Better Work and Enjoy It More!